Descent Route. North off the peak back to the Malcolm Glacier. This climb was inspired by photographs taken by Ebenezer Teichelmann in 1911. Best approached from Heim Plateau, via the col between Malcolm and Hidden Peaks that leads down to the Malcolm Glacier. A more difficult approach exists via Rangitata Col and the col west of Malcolm Peak, descending snow gullies and rock to the remains of Malcolm Glacier. The 500-metre climb is on good rock slabs with a crack providing the crux. From Rangitata Col continue along the Divide, eventually reaching the rocky buttresses of the South West Ridge. The climbing is straightforward on good rock. From Lambert Col via the upper Frances Glacier and Main Divide To avoid the gut directly below Lambert Col, sidle south onto a snow shoulder then sidle northeast back to the Frances Glacier. At 2000m, a significant crevasse can be challenging to cross. Continue up to Malcolm Col then SE, where there are smaller crevasses to the Main Divide under pt 2283m. Follow the Divide along with some easy rockclimbing involved near pt 2276m. From a patch of gravel low on the SW ridge, climb diagonally across the western face towards the NW arete. An easy walk on the ridge completes the climb. From Heim Plateau, cross to the head of the Malcolm Glacier. Traverse round to a small glacier draining the North East Ridge. Climb the glacier and follow the ridge to the summit. From Heim Plateau, traverse south-west to meet the foot of the East Buttress. Climb steep rock and a snow arête to the summit. 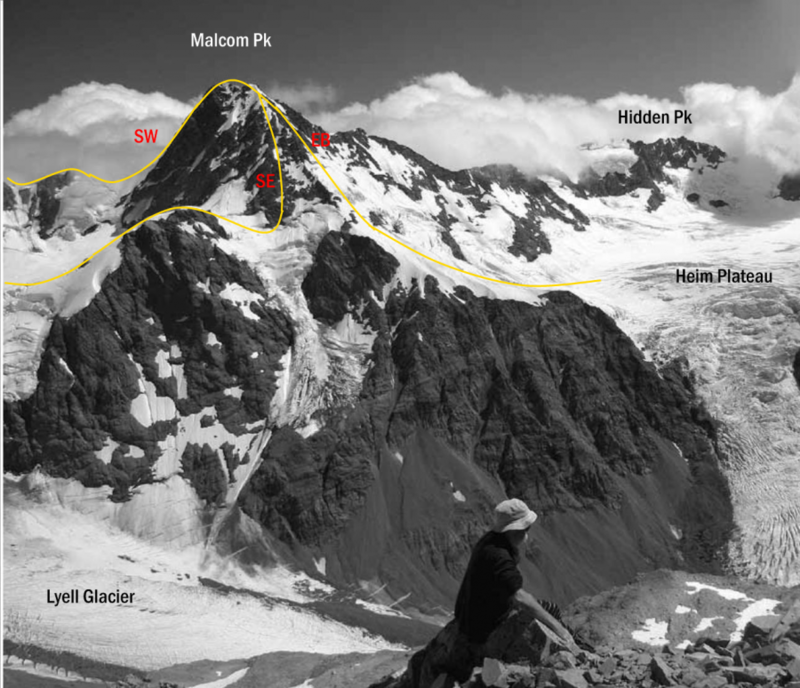 This route is immediately south of the East Buttress and is reached via a traverse from McCoy Col to the col linking the glacier basin at the head of the Lyell Glacier with Heim Plateau. At the start of the route, bypass a 15-metre buttress via a steep gully on the left, and head diagonally across to a well-defined rib which tops the buttress. Follow the rib on loose rock to the summit ridge and eventually join the East Buttress route from Heim Plateau. 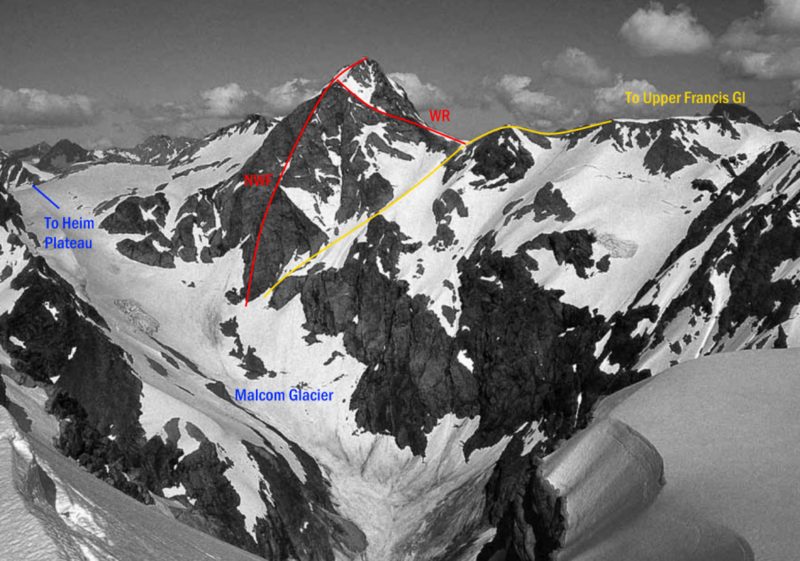 From the Heim Plateau, climb a steep snow face to join the East Buttress just below the summit. Snowboard descents.